Since the beginning of the 21st Century, Morocco has gone through various phases to emerge as a regional economic power conscious of the privileged strategic position it occupies at the tip of Africa controlling one side of the narrow Strait of Gibraltar that links the Mediterranean with the Atlantic and Europe with Africa. Morocco is situated at the crossroad of many cultures, races, religions and civilisations. Since succeeding his father King Hassan II in 1999, King Mohammed VI has been on the move touring every corner of the kingdom to attempt to eradicate poverty, deprivation, illiteracy, corruption, social injustice and put an end to human rights abuses and the inequality of sexes. He initiated social, economic and infrastructural projects transforming the economic and social spectrum of the country into a permanent worksite. Throughout history, Islam in Morocco has woven indelible ties of tolerance with the other revealed religions; Christianity and Judaism. Moderate Sunni Islam in Morocco remains an important element in the fabrics of society. Morocco is also confronted by the surge of political Islam sweeping the Muslim world but Moroccans have espoused Sunni Islam and pride themselves on their tolerant interpretation of religion and what has come to be known as “the Moroccan exception”. The King is faced with the daunting challenge to preserve and maintain this crucial balance as a western-oriented Muslim nation and a tolerant society and at the same time must continue to articulate the vision of a democratic and modern Morocco. Moroccans are deeply aware of their identity as descendents of the great Muslim empires that ruled Andalusia and much of North Africa in the Middle Ages. The deep-seated attachment to its Arab, African and Mediterranean identity explains the kingdom’s natural solidarity towards the African continent, the Arab world and their European neighbours across the strait of Gibraltar. 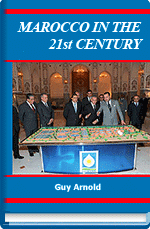 Guy Arnold provides an overview of the current political, economic and social situation and what lies ahead after King Mohammed VI’s decade at the helm of this old nation dating back to the seventh century. The author also explains what reforms, changes and progress have taken place in tackling the various problems typical of an emerging market and what are future prospects for the King, the government and the people of Morocco.